The next day we decided to head right under the arch. 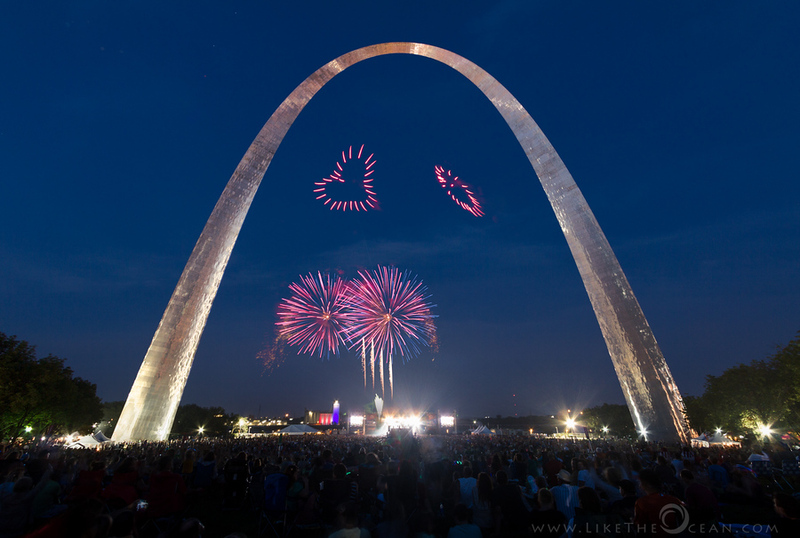 Built at 630 feet and with 900 tons of stainless steel – Gateway Arch – is the tallest national monument within the United States. Standing beneath it gives a sense of awe and humility. None of the pictures does justice to its grandeur. One really need to be there to experience its size. I am definitely not an expert at shooting the moon. I have captured the moon in the past, but am still learning. 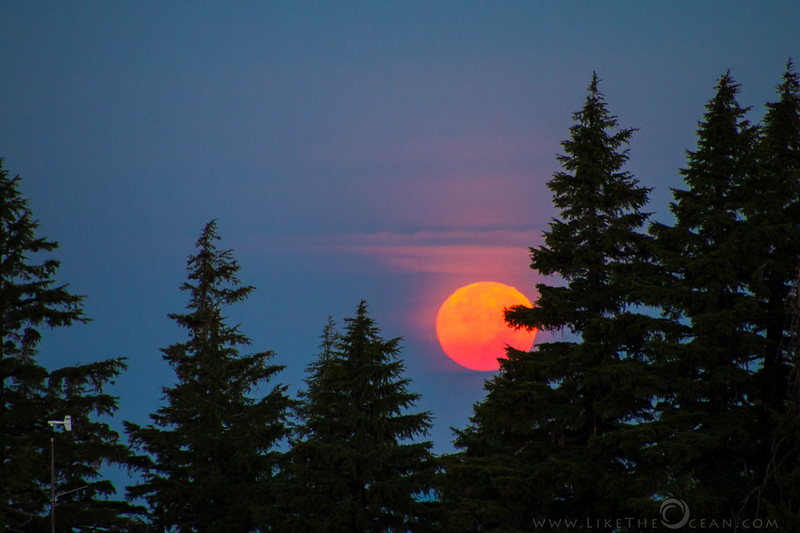 One thing that helps in getting a captivating shot is to capture the moon when it is low – real low – on the horizon. The other is to include a foreground subject to get a scale of reference. Just make sure you far away from the foreground subject and shoot with a really really long long lens [ beg borrow or steal, just get the longest lens you can :) ]. Shooting with the long lens helps actuate the size of the farther object (in this case the moon) by playing with your mind. As with the below shot or this example of the sunset. It becomes much more obvious in this shot by Photographer Alessandro Della Bella. This evening the weather was playing hide and seek. It was supposed to be clear. Then it was all overcast. After lot of deliberation, decided to drive out to the planned spot. It was still an hour or so more for the moon to come up. It was still drizzling. Decided it would be a nice evening walk, if not anything else. Just around the time of the moon rise, the clouds had cleared a bit, but the the horizon was still overcast and hazy. What is the fun if everything goes as planning right :) After suspenseful wait the moon decided to show up – just at the right spot. At the end it was all worth it. 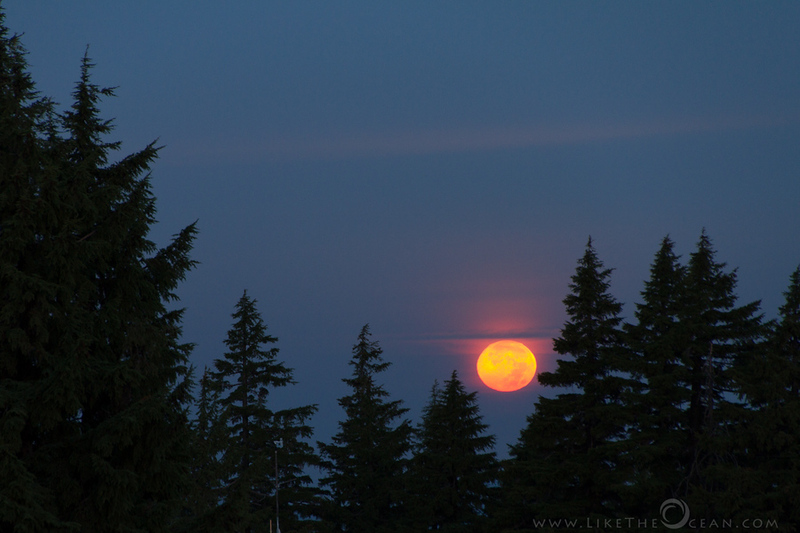 Yes – there is nothing super about the super moon. Actually – every full moon is indeed super. What do you say ?!!! The below shot is a moon set, yes you read that right, it is the moon set and not sun set. It was one of those rare early morning twilight moments during the beginning of the harvest months, when the moon is fiery, large & bright – due to its low position in the horizon. The colors were as is and not modified. You can read more about the harvest moon in this older post from last Aug.
Blue Moon is term for the second full moon in any given month. The phrase ‘once in a blue moon’ is supposed to indicate a rare event – thought the blue moon sighting is actually once or more in around 3 years. And no – the blue moon is no where near blue. 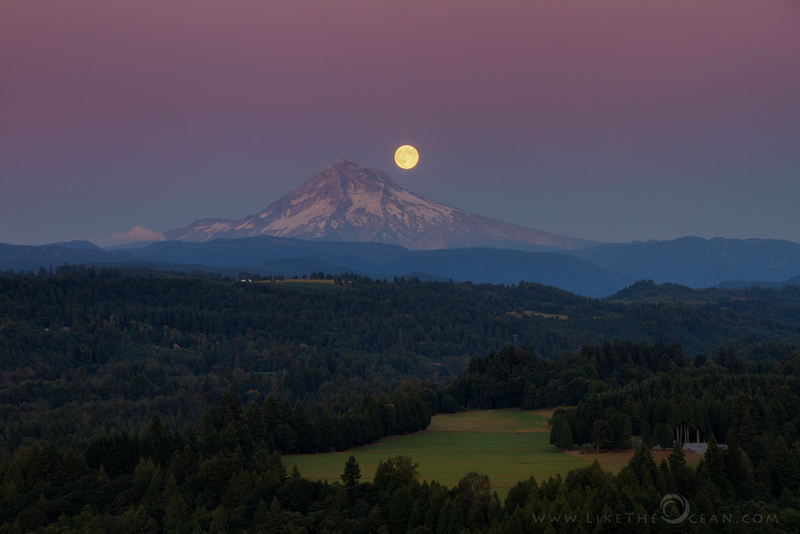 Actually it was having a more warm yellowish glow, as it was rising behind the Mt Hood. This shot required some pre work : being at the right place and at the right time made all the difference. The Photographer’s Ephemeris (TPE) – a nifty software available for both desktop (requires Adobe AIR) and mobile, greatly helped in finalizing the shooting spot and also the location / time of the moon rise across the horizon. P.S: This was taken from the same spot from where this sunrise was shot, wow how much of a difference light can make ! There are those special full moon days, when u feel that the moon is much larger. The drama created by the clouds is so strong, that you just feel like being one with the night. This weeks shot is from one such days. Photographing the moon is a real challenge, if you don’t know how to do it. But just a handful of tips & a bit of trial and error, you definitely can get a keeper. When I initially started shooting the moon, used to set up my tripod and try for long exposure, you see it was night and dark, right ! Wrong. Moon is one of the brightest objects and at the same not static. Hence any thing less than a 1/125 sec would result in not so sharp shot. This article has lot of details on the technicalities of setting up the shot. 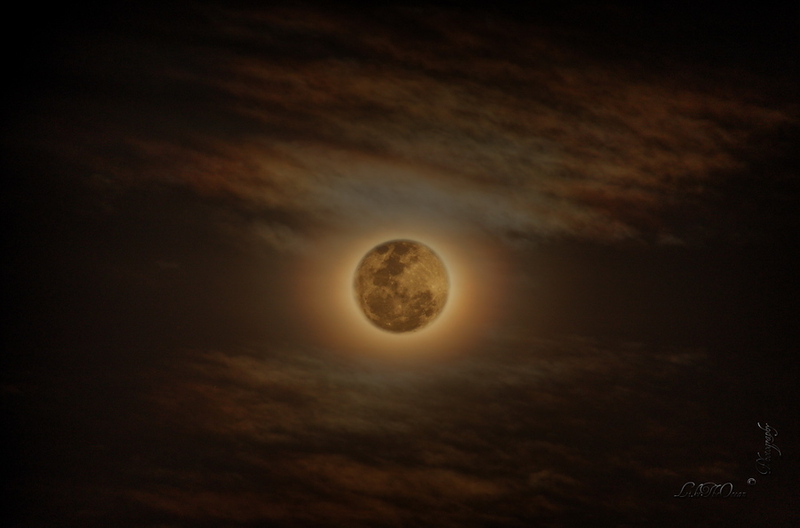 Before you head out, u definitely need to know when the next full moon is. This calendar is handy, yeah gone are the days when we all had the time to look up, every night and know when the full moon was approaching. And to go along with the shot, here is one of my, supposed, haiku. For my non-tamil readers, have tried my best to provide a close enough translation. Hope you enjoy it as much as the shot.